Sen. Mary Landrieu was the last Democrat to hold state wide office in the Deep South. I wonder if she regrets being the 60th vote for Obamacare this morning? (Fox News)- Louisiana Democratic Sen. Mary Landrieu lost her reelection bid Saturday in a runoff race with Republican challenger Rep. Bill Cassidy, despite a relentless, against-long-odds effort. Landrieu, who was seeking a fourth term, trailed by double digits and had lost most of her support going into the election. With 100 percent of the precincts reporting late Saturday, Cassidy had received 56 percent of the vote, to 44 percent for Landrieu. 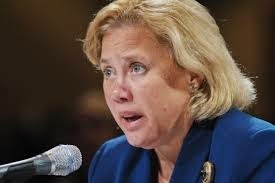 Landrieu barnstormed the state this week, driving some 1,200 miles in a rented SUV, stopping in little towns and bigger cities, making one last appeal to voters to give her another term in Washington.